The Lapwing or va nellus vanellus is on the Royal Society for the Protection of Birds red list which means that it is considered a globally threatened high conservation priority species. This is not something you want to take care of on your own if they have decided to lay eggs in your garage or are attacking other songbirds – as they are wont to do. They will even go after birds of prey with a high degree of success. 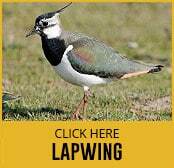 A member of the plover family, the lapwing or vanellus vanellus is also known as the Peewit or Green Plover. Because they do not create nests they will simply lay eggs in groupings of four at a time in tall grass or ditches. This can attract other pests as a source of food and if the eggs are disturbed and the birds give up on their unhatched babies there is now a rotting source of food for other pests to come into the area. Professional pest control experts, our staff are fully trained in how to deal with this type of bird. We know the lawful way in which to deter the birds from the problem area of your home or garden, and how to help them relocate safely away from where they are causing the disturbance. Doing the job yourself may cause you to harm the environment or violate the law in regard to the treatment and hunting of endangered birds. This could result in a hefty fine, so please call us.